The newest addition to the palette of high quality and innovative full face masks by ResMed is represented by the AirFit F30 Full Face mask. ResMed is a world-leading provider of CPAP masks and oxygen therapy equipment and accessories. The company continuously strives to offer the best quality products, placing a huge focus on patient compliance and comfort. AirFit F30 is a full face mask that promises to reduce facial red marks and irritations. Patients who use full face masks generally need to put up with nasal bridge sores, facial red marks, and other such inconveniences. The AirFit F30 not only promises but also delivers the best of comfort packed in a minimalistic looking product. According to the company, the mask also allows patients to wear glasses comfortably while wearing their mask. This way, users can read their newspaper, work on the laptop or watch TV, all the while receiving required therapy. AirFit F30 is an ultra-comfortable, low profile mask that helps even first-time therapy users become quickly compliant with required therapy. Most patients who breathe through their mouth are recommended the use of a full face mask. These masks help them get the required therapy even while their jaw drops, and their mouth opens. One of the biggest problems is that full facemask wearers struggle quite often with feelings of claustrophobia. This is given the fact that their mask is heavy, bulky and feels quite tight to the skin. AirFit F30 is designed so as to completely eliminate these problems. Patients will no more get claustrophobic feelings because the mask is ultra-light, flexible and provides the perfect seal without causing irritations or red marks on the skin. During the months of April/ May 2018, ResMed conducted a clinical study on Australian patients. In this study, they compared several masks including the AirFit F30 and Amara View full face mask by Philips Respironics. The results showed that approximately 80% of the patients preferred using the AirFit F30 full face mask, for its ease of use, comfort, and therapeutic efficiency. Then, a Fitting Study conducted by ResMed this year shows that 60%+ of the patients reported that ResMed AirFit F30 had a much better fit and a more comfortable seal when compared to other product within the study which was the Amara View full face mask by Philips Respironics. Here’s and Airfit F30 review of the features. – Ease of use. Quietness. Great stability. Perfect seal. These are only a few of the main highlights of the new AirFit F30 full face mask. 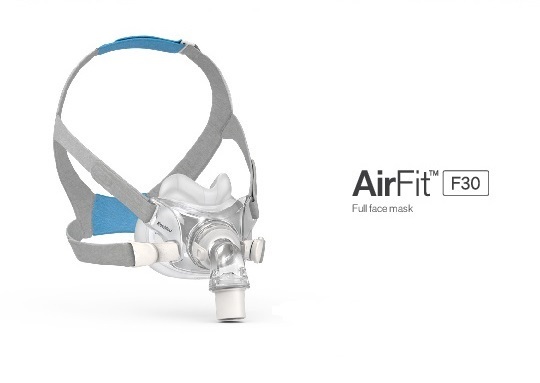 AirFit F30 is a truly minimal contact full face mask. It comes in contact with your skin in critical points only, yet it maintains a perfect seal and offers you the best of comfort all throughout required therapy. Universal Headgear- AirFit F30 comes with a universal headgear, one size fits all. The headgear is manufactured of a highly durable yet flexible material. Thanks to this flexibility, the mask fits perfectly patients even from the first try. The innovative headgear follows naturally the individual contours and facial structure of the user. QuietAir Ventilation System- Most full face mask have a universal ventilation system. The air comes out through this vent system, and quite often the noise will wake up the user and even the bed partner. 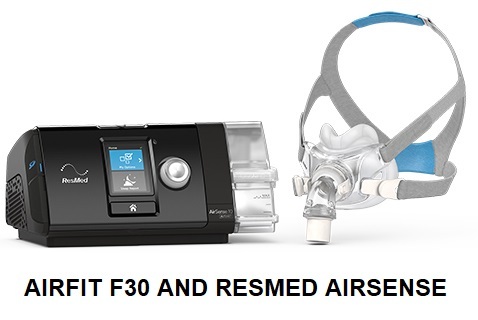 ResMed comes with an innovative addition to the AirFit F30 full face mask. The QuietAir Vent system will basically break up the exhaled air and then disperse it in the smoothest and quietest possible manner. Thanks to this, AirFit F30 is one of the quietest full face masks available on the market. With a quiet ambient noise, both the parent and the bed partner can enjoy a restful night of sleep. Quick Release Elbow- patients can disconnect the mask from the tubing with one single click. This is especially helpful when patients need to visit the bathroom during the night. Simply disconnect the mask, and then reconnect it with the help of the quick release elbow. No need to take off the mask, but simply detach it from the tubing for the time needed. UltraCompact Cushion- The innovative cushion of the AirFit F30 provides the most secure seal and a comfortable wear. The cushion helps to prevent red marks and irritation around the bridge of the nose. The cushion is very comfortable and soft yet providing a truly stable and secure seal. Choose your full face CPAP mask carefully. There are plenty of offers on the market, but it is highly important that you find one that fits you on an individual level. You need to ensure that the mask feels comfortable first of all. Then, you need to ensure that the mask provides a good seal, without having to make too many adjustments. Last but not least, the perfect full face masks feels light on your face and allows you to fall asleep without feelings of claustrophobia. AirFit F30 by ResMed not only promises but also delivers on all these factors. All night long I am waking because air is leaking and mouth is completely dry down throat. I tighten, I loosen . it doesn’t matter, still leaks. I’m wearing the medium. What am I doing wrong? I have to think that you were fitted incorrectly. We find that most women were a size small. ResMed mask are not meant to be worn tight. The strap are only to hold it lightly in place and when you turn on the machine the cushion will adhere to your face. I would contact the place that fitted you and see about trying a size small. I bet that solves the problem. Personally I really like the AirFit F30. I have just gone from a nasal SWIFT FX mask to an Amara full face mask. 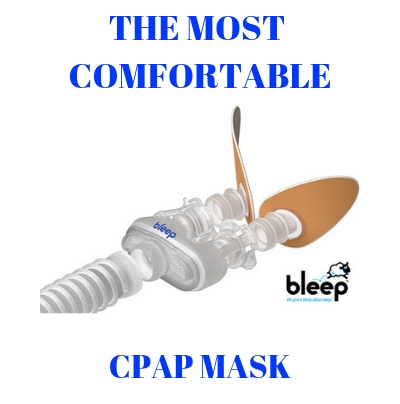 I was having problems after 25 years with the nasal mask sealing and changes in my situation which are going to require higher pressures and probable BiPap. While hasseling with sleep tests, medicare and suppliers, I decided to go with an Amara mask in the meantime. It works pretty well and comfortable. Stopped my snoring completely with no pressure changes. One possible problem I see is that the mask vents just below the eyes. When side sleeping the pillow can deflect air into eyes. I think I will try the Resmed F30 that vents in the elblow at bottom of mask and is claimed to be super quiet. Almost identical designs otherwise. Another problem that I did not have with pillows was dry mouth and lips. Will keep playing with heated air flow settings to help that. Hell to get old! Sorry this does not address situation above but hoping to get some input. I was just fitted with the F30 and I could not breathe out of my mouth and my nose- just my mouth. I woke this morning with deep grooves along my jaw and a blister-like red mark on my left cheek. The mask hurt my nose when I removed it. Sounds to me that you have it on to tight. The ResMed AIrFit F30 should be snug to your face and when the machine is turned on it will form suction to attach to your face. Not only will having it to tight scar your face but it will ruin the cushion. Try loosening it up. I am female and have central and obstructive sleep apenea and have had to try several full face masks with various problems. 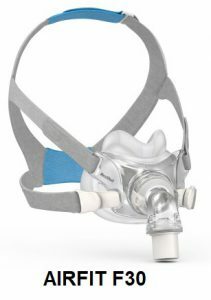 I use a ResMed ASV air sense machine and have tried the new ResMed F30 full face mask with the “one-size-fits-all” headgear. I love the cushion but the headgear is way is too big for my head. No matter with all strap adjustments I could not get a leak proof fit and the top of the head strap will not stay in place no matter how you loosen or tighten it. I’ve tightened all straps as much as could be tightened and this headgear is still too big for my head. ResMed PLEASE PLEASE PLEASE make smaller headgear for women for the F30 full face mask. Does your AirSense device need to be updated for a new mask setting or will the FullFace setting be ok?